Disaster preparedness and risk reduction play a major role in preventing the loss of lives and livelihoods during disasters. Directly and with partners, Save the Children has been preparing vulnerable communities for natural disasters since 2005 and continues working with government, communities and children to build capacity on disaster risk reduction, climate change adaptation and effective humanitarian response. We mounted major responses to disaster starting from the 1970 cyclone to the recent 2016 floods in northwest and cyclone ROANU in south-east, and we have the capacity to respond to any disaster which puts children at risk. By co-leading the education cluster, , through membership of SHONJOG, ARCAB, Urban Forum, clusters, INGO Emergency Subcommittee, INGO Representative of Armed Forces Division (Civil-Military Coordination) and Urban DRR, Climate Change Adaptation, Humanitarian response, Education in Emergency and humanitarian talent development projects, Save the Children plays a vital role in advocating disaster management policies, developing new humanitarian professionals and ensuring continued education in emergencies for affected children. Save the Children as the humanitarian and development organization is committed to reducing children’s and their care giver’s vulnerability to humanitarian crisis, ensuring their right to survival and development. In the new CSP 2016-18, the major change that will bring broader and exhaustive initiatives of disaster risk reduction and climate change adaptation is integrating these initiatives under all five thematic areas. Resilience in livelihood, education, protection and health & nutrition are one of the priority areas under each thematic section in this new CSP. Humanitarian sector will work closely with the development sectors and government agencies, city corporations, INGOs and local partners to enhance capacity and advocate to bringing sustainability for these resilience initiatives. In addition to the rural context, humanitarian sector will also focus in the urban context specially targeting working mothers, children and communities to enhance their capacity on preparedness and develop volunteers to support government initiatives. This will be done by jointly working with government agencies and city corporations considering urban and rural hazards that causes significant damage in urban and rural livelihoods. 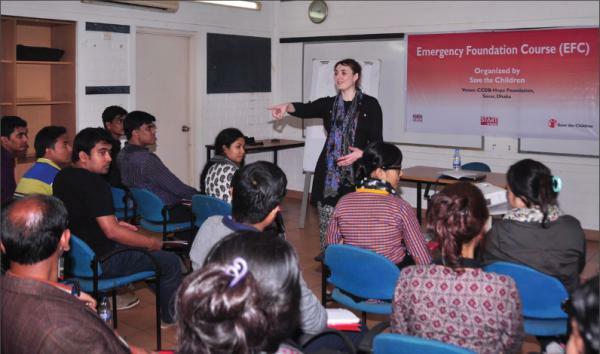 To respond to a disaster effectively and more efficiently, humanitarian sector in Bangladesh has prepositioned local partners, and building their capacity on effective disaster risk management based on geographic locations. A prepositioned partner will be able to effectively respond to any humanitarian situation with the trained capacity and prepositioned vendors and contingency stocks. As local partners play a vital role in any humanitarian response, these prepositioned partners will be the members of partner’s network that will contribute to share information and enhance coordination during disaster and normal situation. A huge effort will be given to enhance the capacity of Save the Children and partners’ staff on emergency preparedness plan and humanitarian quality frame work to maintain the standard benchmark of Save the Children in response initiatives.